An exciting thing happened a couple weeks ago. 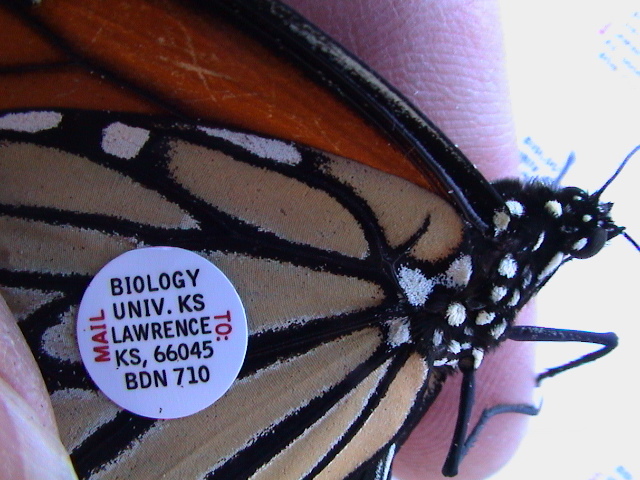 I got email from Donald Davis, one of the leading Monarch Butterfly aficionados in Ontario, asking me if I was the Kimberly Gerson who tagged a monarch butterfly in Whitby Ontario, in September of 2006. If so, he went on to say, my tag had been recovered in Mexico. Someone probably found your tagged monarch the spring following your fall tagging and held onto the tag until finally being able to sell it to the Monarch Watch representative that was purchasing tags this spring for Monarch Watch. 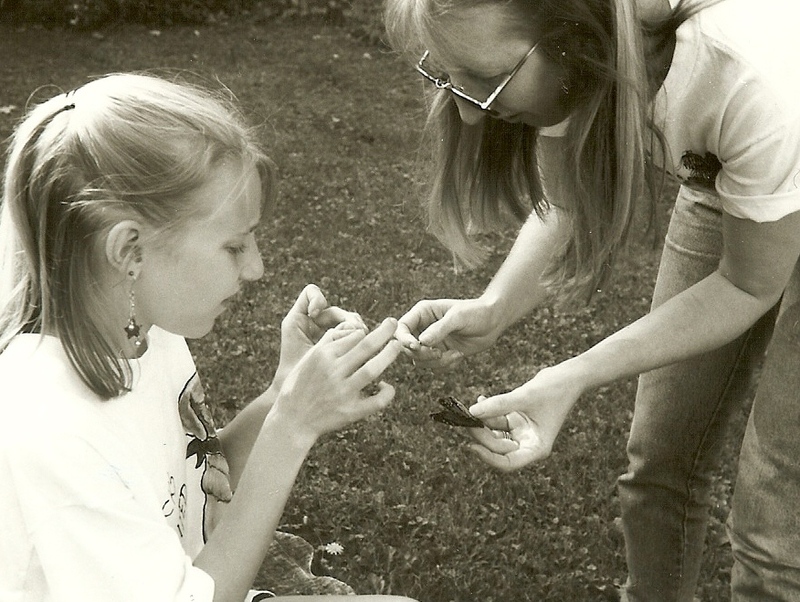 Through Monarch Watch, I have been tagging monarch butterflies (Dannaus plexippus) off and on since 1994, when my daughter (then 11) and I and some friends attended monarch tagging session in Plattsburgh, New York. We were the only 4 people who showed up so the two little girls got a private lesson in how to catch and tag the butterflies. We left that day with a set of tags, a data sheet, and the resolve to catch or hatch enough butterflies to use up all 24 tags. 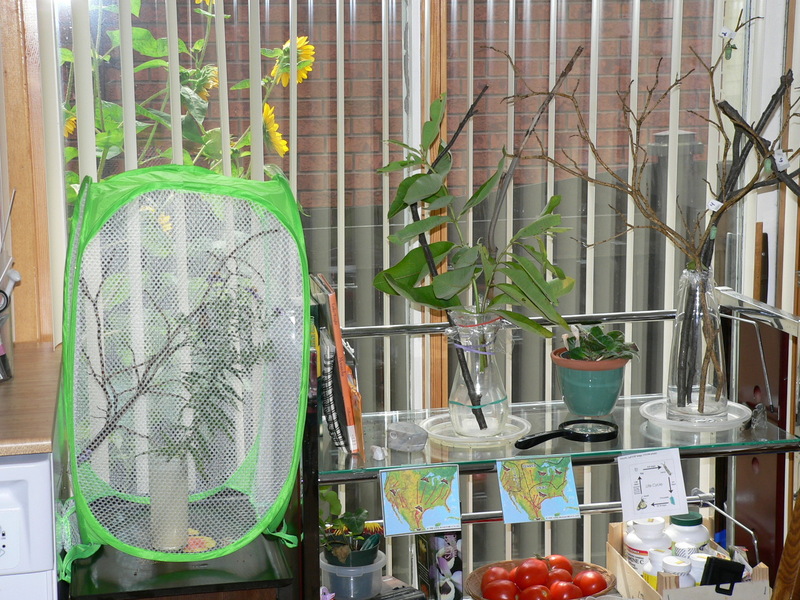 We caught some wild, but also collected caterpillars and raised them in our kitchen. Once they emerged from their chrysalises and seemed ready to fly, we’d glue on a tag (back then they weren’t self-adhesive) and feed them apple juice or sugar water to give them strength for the long journey. None of our New York butterflies were ever recovered in Mexico, but one was found several miles from where we released it – collected by a child who was presumably as excited to find it as we were to learn that it had been found. For us, that was the proof of concept we needed to keep us tagging for several more years. These days everyone has heard the story of the monarch migration, but I’ll quickly recap how it works in the Eastern North American population. 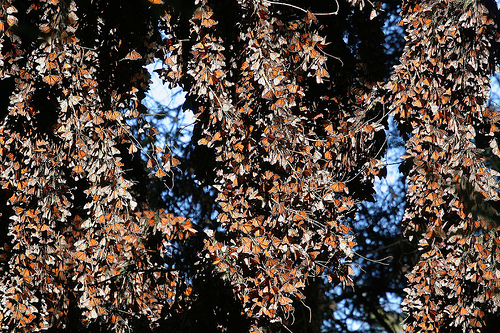 These monarchs over-winter in huge colonies in Mexico. They don’t exactly hibernate, but the cool weather slows their metabolism allowing them to live off fat reserves. In the spring, as the weather warms, they leave the colony and disperse north to mate and find milkweed on which to lay their eggs. Most end up in Texas. Over the next months the eggs laid in Texas hatch, become voracious little caterpillars and eventually monarchs. 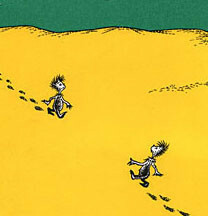 That generation then flies further north in search of more milkweed. Several generations later the first monarchs arrive in southern Canada – the northern limit of their range. The final generation that hatches in Canada in mid to late August does not mate. This is the migratory generation. They will fly all the way back to Mexico in one fell swoop, eating and gaining weight along the way so that they will be fat enough to survive the winter. Interestingly, monarchs are a tropical species. The genus Danainae is thought to have evolved in Central America and northern South America. When the ice sheets receded 12,000 years ago, the monarchs (Dannaus plexippus) moved northward into Mexico while their sister species, known as Southern Monarchs (D.erippus) moved into South America. So what are these bright tropical animals doing fluttering about southern Ontario until well into September every year? Why not just stay where they are? Blame the milkweed. 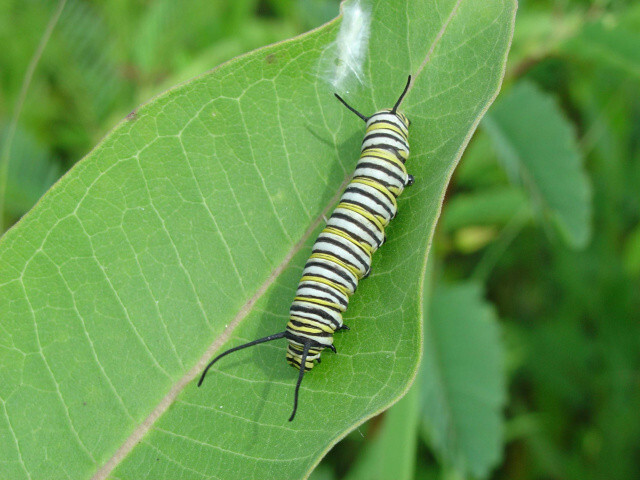 Milkweed of the genus Asclepias is the only thing that monarch caterpillars can eat. In fact, so tied are monarchs to this host plant, that their lengthy migration may just be an accidental outcome of the expansion of the milkweed range that has occurred since the recession of the last glaciers. As the milkweed spread north, the butterflies followed, but still unable to survive the cold northern winters, they must return to Mexico every fall. Now one might imagine northbound butterflies and southbound butterflies, each being born with genetic programming that tells it which direction to go. But entomologist and world renowned monarch expert Lincoln Brower has put forward another intriguing theory. He notes that the butterflies leave Mexico on the vernal equinox, March 21st. At this time the days and nights are the same length. Those butterflies fly due north. But as the days of spring and summer grow longer, each succeeding generation flies slightly more to the east, so the last “northbound” generation ends up in the Great Lakes region far east of where the first generation began. Brower’s hypothesis is that if you could track the butterflies over smaller distances, you would find that by the summer solstice they are, in fact, traveling due east and continuing with that trend, by the autumnal equinox, they’d be heading south. He explains it well here. How science has come to know so much about the travels of monarchs is a testament to citizen science programs. To track an animal that ranges over an entire continent takes thousands of eyes and millions of data points. In 1952 Zoologist, Fred Urquhart and his wife, who had been tagging monarchs on their own since the 1940’s, called for volunteers to help catch, tag, and report on monarchs in order to solve a mystery: where do the monarchs go in the winter? 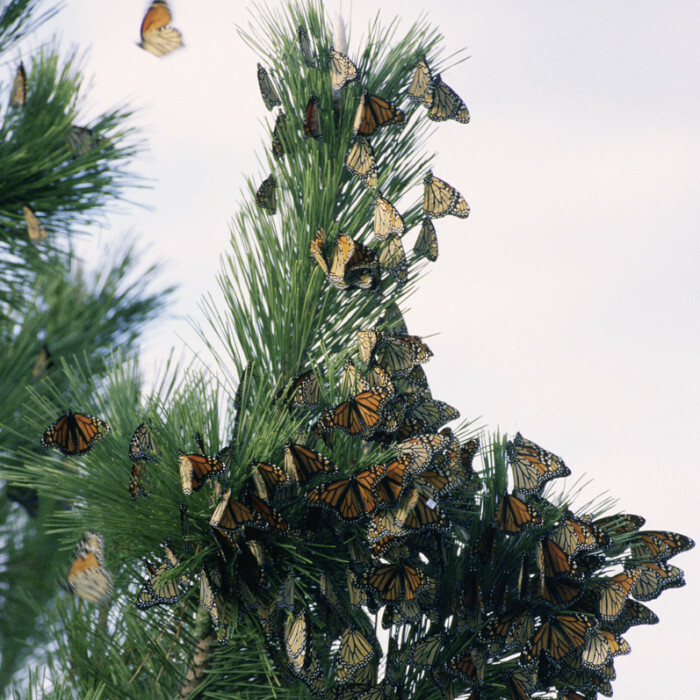 For the next twenty years thousands of volunteers glued little notes on hundreds of thousands of butterflies saying, “Send to Zoology University of Toronto Canada.” Finally, on January 2, 1975 a quiet textile engineer and amateur naturalist stood among the oyamel trees in Mexico surrounded by millions of monarchs, and knew he had found the answer. Kenneth Brugger had read about Urquharts’ project in a Mexican newspaper and recalled seeing large groups of monarchs during his travels there. Persuaded by Urquhart to try to find an overwintering site, Brugger made a trek to the 10,000 foot level of the oyamel forests and there he beheld a sight that, until then, had only been witnessed by local villagers — the winter home of tens of millions of butterflies. He phoned Urquhart and, at that moment, 25 years of citizen science paid off. Since then volunteers have been responsible for a large portion of the data that has been collected on monarch movement and migration. The information has helped answer questions about monarch habitat usage, population dynamics, environmental impacts, and the effectiveness of conservation efforts. But as important as the data, citizen scientist programs generate enthusiasm and awareness in the public. Author and anthropologist Barbara J. King recently wrote a piece talking about how important it is for zoos to name their animals. Unlike with tigers Kadar and Tahan, the monkeys and apes, the elephants, and indeed almost every other animal in the zoo, remained nameless, a kind of abstract representative of its species. What kind of a lesson is that for children to learn, when science (and experience) tells us that many, many animals think, feel, and express distinct temperaments? And this is what citizen scientist projects are all about. Programs like Monarch Watch and Journey North allow people to move beyond that “abstract representation” and instead have a direct connection with an individual animal and then to learn something from that animal’s experience. We tagged monarchs in NY for a couple of seasons, then life moved on and so did I. Ten years later I resumed the project in Ontario with a brand new set of step-children (then 9 and 11) and we spent another 3 or 4 seasons tagging. Monarch Watch had moved forward by then. The tags were now self-adhesive. The database of recoveries was online and searchable. Over the years I checked in a number of times, searching my last name, but only ever saw my daughter’s one NY butterfly recovery. Don Davis’s email then was an exciting development. Enough so that I went back to the database and searched my name again. To my surprise, there were two more besides the one Davis alerted me to. Suddenly it was no longer just a fact that monarchs migrate 4000 kilometers. This was my monarch, the one that I had held in my hand, perhaps even watched emerge from her chrysalis. This was my monarch that had carried her tag on papery wings all the way to Cerro Pelon, Mexico where she joined millions her kin in a torrent of butterflies so thick and single-minded in its journey the event is called the Monarch River. This realization caused me to think more deeply about monarch migration and the tagging program itself. Imagine what had to come together to make proof of my monarch’s trip happen. First, of course, Monarch Watch had to have a tagging program in place here in Canada. Then I had to hear about it and care enough to buy tags and commit most of my fall weekends to traipsing about the fields with a butterfly net, tags, and data sheets. That was the easy part. My butterfly, once tagged, had the real work. Chased from the north by cold, she had to not only fly south for 2500 miles, she had to gain weight in the process. That required an adequate nectar corridor right across the United States, particularly in urban and agricultural areas. Along that flight path she also had to locate where other monarchs were roosting for the night. Many people who live along the monarch’s southbound flyway are familiar with monarch congregation sites. These are trees that are used as shelter year after year by thousands of monarchs that crowd together for warmth, dangling from the branches like fall leaves. And finally, in Mexico, a local citizen had to care enough to notice a little tag in the torrent of butterflies streaming out of Cerro Pelon. He had to take the time to collect it and then hold on to it for five years before someone from Monarch Watch was available to get it from him. So to document her journey, the citizens of the monarch’s three home nations have had to work together. Now, to ensure her species’ survival – to preserve her breeding and nectar resources and her over-wintering and congregation sites – we will have to continue to do the same. wow … fantastic article/blog …. you have the makings of a book … just when a question came to my mind as I was reading, you answered it in a following paragraph. Once the Monarch Butterflies manage to make it all the way from Canada down to Mexico, why don’t they just stay there? Answer from Dr. Laura Timms, Postdoctoral Fellow at the Lyman Entomological Museum on McGill’s Macdonald campus.